1. Hair Mascara. Slicking back that pony tail with the help of your trusty nit-comb so it was entirely bumpless remembering to leave two strands (center parted) hanging down either side of your face. Then brushing orange mascara through one strand and purple mascara through the other. 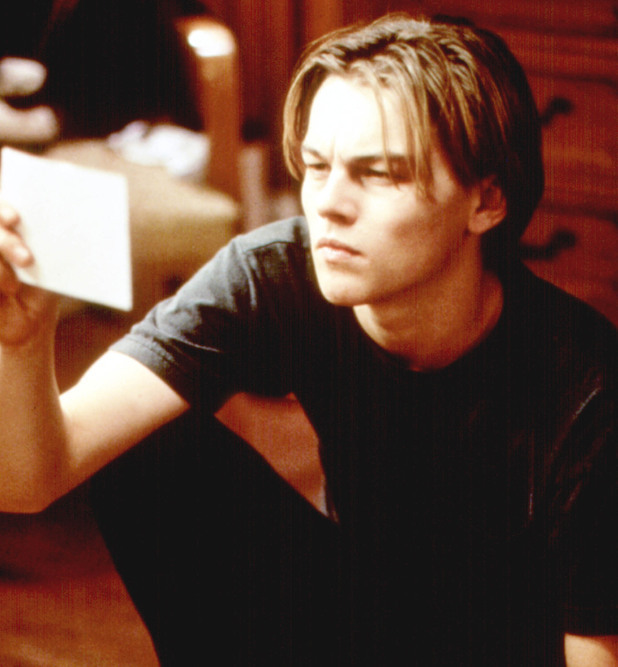 Dip dye, dip shmy…this was cool before it was cool. 2. 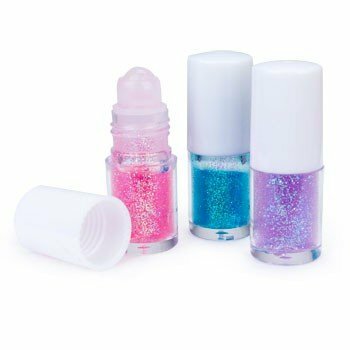 Roll on glitter. Always applied to the face in a butterfly motion. 2. 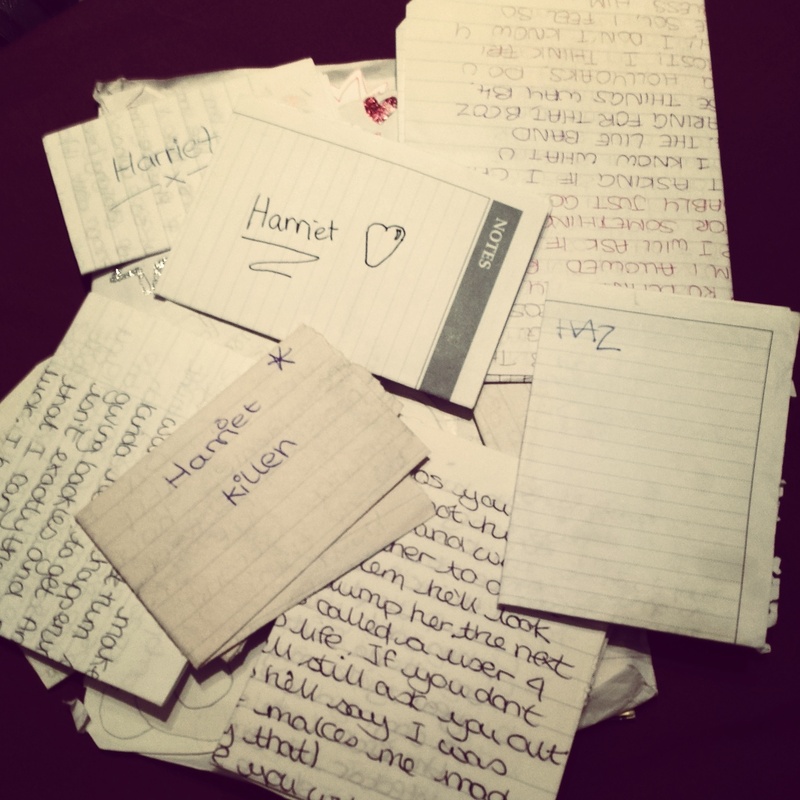 Handwritten notes. Passed to you best mate during maths and written in an assortment of glitter gel pens and decorated with stamp pens. You always opened with “How R U?”even though you knew she was just fine because, oh yeah, she was sitting next to you. 3. Skirt/Trouser Combos. Thanks to Steps and the like we LOVED this trend. 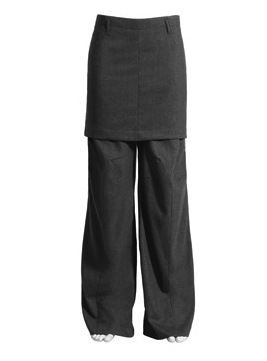 Not just any old skirt thrown over trousers though. No you bought this as a complete item, a Skrouser if you will. And they looked so fricken stylish. Then when you got a bit older there was the dress that split up to your belly button that you wore with matching, colour co-ordinated hot pants…except your mum wouldn’t let you get this (from Tammy Girl obvs), she thought it was ‘too grown up’ read: slutty. 4. Ben ‘man’ from Byker Grove. So fit. You always chatted about your love for him in Geography. He’s so much more interesting than sedimentary rocks. 5. Top 10. The most important list of your teenage years Top 10 boys you fancied (see, I loved a list even back in the day!). Number one, two and three were interchanged on an hourly basis, depending on who you’d just had a lesson with. The rest were just filling spaces thanks to your small school and therefore limited choices. If things got really desperate, sometimes a boy from the year below would make the cut and when you were feeling really confident you even included Ben ‘man’ from Byker Grove. 6. C.U.O.G.I.T.L.A.T.D. Catch up on Gossip, in the Library, about the Disco and other super simple codes you and your pals made up. Sometimes even your Top 10s were coded just in case anyone came across your notes…the only flaw being was that in order to crack said code you only had to look on the back of the note. There was even a handy PTO at the bottom of the page. 7. 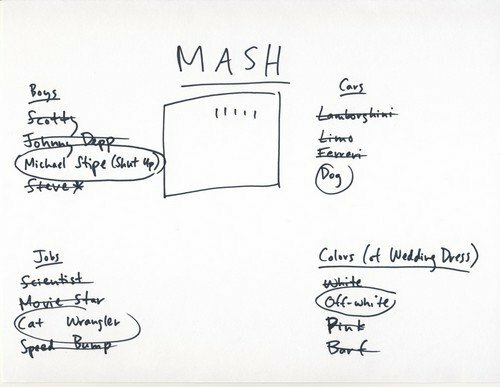 MASH. The answer to LIFE. 8. Dance Routines for Main Assembly. Finally your time to shine and show the whole school what you could do. There were after school rehearsals, matching outfits and I think even hair mascara. Come the performance you’d give it your all thinking that you were Britney (pre-melt down) before realising there wasn’t as enough space at the front of the main hall and you’d trip, landing on one of the younger student sat on the front row. 9. Bubblegum dolls. Nutty Tart, Groovy Chick, Disco Diva, Footy Mad. Purchasable from Clinton Cards, you renamed all your friends after these dolls and had the poster in your room. Also, when you finally got a mobile phone you saved your friends’ numbers under these names too…annoyingly though you forgot who was who apart from Footy Mad as that was the only boy’s number in your Nokia 3310. 10. Playing on ‘The Bubblegum club’ website was also how you spent every IT lesson (I still refuse to call it ICT). Still surprising now how you only got a D for your GCSEs (unless my boss is reading this and then I got a C just as my CV states). 12. SQUIRT. Silent Quiet Uninterrupted Reading Time. The challenge during this 10 minute period after the register was taken, was to use every ounce of your energy to stifle the mad laughter just dying to escape thanks to your friends and their childish humour. Remember that time Amie bought a GIANT book into SQUIRT…HOW FUNNY WAS THAT??? Guess you had to be there. 13. Adidas Popper Trousers. So fricken cool…I mean…HIDEOUS just hideous. But not as bad as a full luminous yellow Kappa shell suit that I totally did not own. with matching Kappa trainers…and shorts…and t-shirt. 16. Arthur. Best program intro EVERS! C’mon everyone you know the words…”and I said HEY what a wonderful kind of day…we can learn to work and play and get along with each other”…HEY DW!!!!! 17. Flat-chested and Frigid. Two of the biggest insults used by 13-year-old girls. Imagine someone using either against you now, just laughable but at the time – Hey IRONING BOARD – that cut deep man. 18. Low slung jeans and Brazilian Knickers. Pastel shades purchased from La Senza poking over the top of your super low waist, super flared Topshop jeans. Or if you were really grown up…it was a thong! 19. 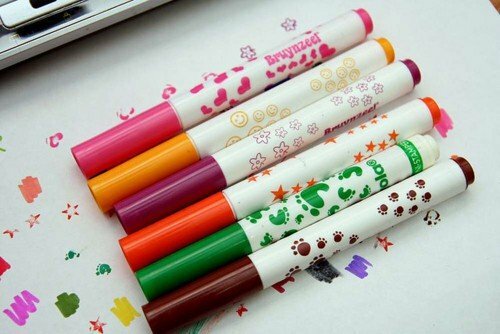 Eraser Pens. And using them too much on the same word so that the page went all soggy and ripped. 20. You and your girls saying OOH SCANDALOUS like the Ashley’s from Recess. 22. Routines at the Disco. All jumping into a line of varying heights and pretending you were b*witched on the Rollllerrrrcoaaaster of liiiife. 23. Butterfly clips and twisting you hair back with them. 25. 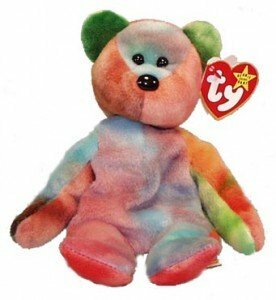 Beanie Babies. You only had one but another friend had nearly all of them and they were going to be worth SO MUCH MONEY ONE DAY!!!!! 26. School Girl Raps. With Run DMC and Coolie Gangster’s Paradise all over the charts it was only right you and your pals laid down some sick bars. And thus the Fashion Chicks were born. “We’re the Fashion Chicks and we’d just like to say about how-a fashion is-a coming yo way. We like Elless-e jackets and Kappa Kickers. No granny jumpers or Aladdin knickers. Bank Holiday Weekend: Belgium Baby!!!! Southampton you say? Townies were the scum of the earth and I used to hang out in the bar gate when they had benches v and played less than jake/offspring. Good times. I think someone tried to argue the skirt/trouser combo into the school uniform. It said that girls could wear a skirt or trousers but didn’t actually specify that you couldn’t wear both at the same time. I don’t think it went down so well with the teachers but we could all see where they were coming from. Haha – I’m sure we probably tried something similar at school too! Anyone 30 or under can fully relate to this!!! Love this! But what about denim jackets worn to school? I was such a badass. Reblogged this on Chilanga : Exported. This is so accurate – although I have a couple for you ‘power beads’ and those wire style chokers 😛 90’s preteen-hood complete! ha yes POGS! I also remember having those plastic dummies that you’d wear around your neck. I just had to share this today. Totally brightened up my Monday! Baby G watches were also massive back in the day! They cost an arm & a leg but you just weren’t cool without one! P.S. I totally would have forgotten about the hair mascara, love that you started with that one!